Animated PNG files work in many regards just like gif files displayed on Internet sites. They offer several advantages over gif files on the other hand including support for 24-bit and 8-bit transparency which gifs do not support. Transparency and the fact that 24-bit colors are supported are what makes animated PNG files interesting as they look good regardless of the background they are embedded on and thanks to the increased number of colors, usually better than comparable gifs. The downside to this is that they are usually larger in size because of it. The format is a extension to the PNG file format that is currently not a standard. What this means is that most browsers don't support the feature yet. To be precise, only Mozilla Firefox and Firefox-based browsers support animated PNG files at the time of writing. The Opera browser did support it up until version 12.x but the new Opera that is based on Chromium does not support it. If you open an animated png file using a browser that does not support it, you will see a static image file instead since the first frame of the file always stores the standard PNG stream so that it can be displayed instead of the animation. If your browser does not support animated png files, you will see a static image of a ball. If it does support the format, you will see a bouncing ball instead. 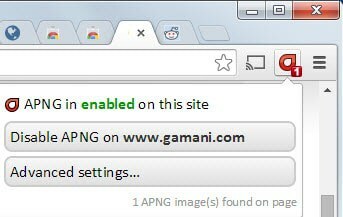 Google Chrome users who want to add animated PNG format support to their browser, for instance because it is a format used on websites they visit, can install the APNG extension for it to do so. It works out of the box on all websites you visit (whitelist mode) but can be switched over to work only on sites you explicitly permit it to run instead (blacklist mode). Both modes come with options to allow or block animated png files on select websites. While I have not tested the extension in Opera or other Chromium-based browsers, it is likely that it will work in those browsers as well. The support the extension adds to the Chrome browser works well for the most part. According to the author's description, support for CSS images may be incomplete though. Doesn’t work on my chrome v35 for some reason. The ball appears then disappears. Chrome canary, doesn’t work either. Edit: Works if you try to open image in new tab. Yea but it’s not practical if it doesn’t work on page load. Just so to let you know upcoming Safari 8.0 in Mac OS X 10.10 and iOS does support APNG. You need to update your article to reflect this and I think Chrome should move to add APNG support and soon IE will come to this as well. It works straight out of the box in Firefox 30.0! Note about the size: Generally the files I’ve converted from GIF to PNG are anywhere from 10-50% smaller. One freeware program I found PNGOptimizer (http://psydk.org/pngoptimizer) does a great job and generally brings down the size without hurting quality. It appears to be the same bouncing ball as in https://es.wikipedia.org/wiki/Animated_Portable_Network_Graphics and I can see that ball bouncing, what is happening here? Maybe a trick to promote the extension? I have found a similar issue uploading an APNG file (with the .png extension) to my website. It works in Chrome when loaded from the HDD but once uploaded to the page it only shows the first image. Server related issue?